Ok so first off have to tell you this. 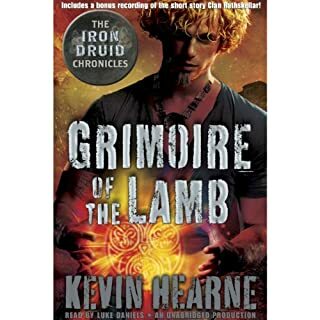 Grimoire of the Lamb is the first store on the book which is about 2 hours, then you get a random chapter from the 6th book. THEN AFTER the chapter (which is about 10-12 minutes) another story, Clan Rathskeller, starts which is 45-50 minutes. Why they choose to separate the stores with a random chapter is very strange and from the other reviews, confusing to many and those skip the 2nd story. Recommend you skip this, its not even the 1st chapter which even makes it make less sense. Anyways Grimoire of the Lamb is a good story. I like the inclusion of different gods other than the Irish or Greek variety. Its a good story with a little bit of over the top action narration (from the author not the reader) that is ok but something that was probably a 5 minute scene takes place over what seems to be 10-15 minutes, even so its not THAT bad. Clan Rathskeller is great too. I think this is more read like Hounded (the first book) which ties in nicely. Overall satisfied with the stories but for the same price as the first three books it seems a little excessive. Should probably be about half the cost. I wish that Hearne would have just written these into its own full book. I understand his "9 book" reason but cmon SUPPLY AND DEMAND! Good stories, awesome Iron Druid fun. For a fan of the series, this will feed your need even if it is just for a little bit. So when you think of superheros what comes to mind? Most of us will probably think of people with super strength, psychic ability, flight, ect. Well this goes right on with those thoughts. This right from the beginning grabs you with its action scenes and you want to hold on until its end. 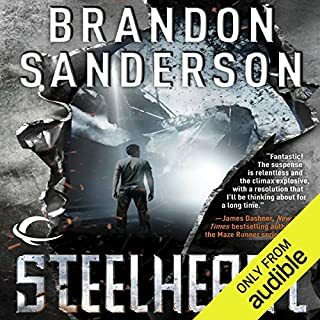 Brandon Sanderson does not disappoint with this book. An amazing start to a series. I cannot wait until the next book is released. One thing I dont like about the book is that some of the weaknesses are a little ridiculous but it doesnt take away from the story. Besides the super powers you get a story about a little boy that grows into himself to finally finds out what his father feels but he quite never understood. There is even a bit of love and heartbreak through in. Overall an excellent book. 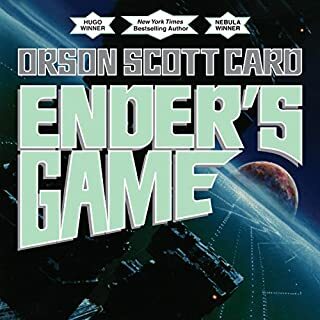 The narrator does a great job with his voices to distinguish out the different characters. Definitely will be getting the rest of the series....hopefully just wont be too long of a wait. I know during middle school and some of high school this book was selected by some classes to read, however I never read it. Well now that the movie is coming out I figured I should. So I was very impressed. Not only does this book still hold up to modern times over 20 years after it is written, it holds on and doesnt let go. I love the concept, it makes a lot of sense when you think about it. I wish there were more backstory on what actually happened to lead to to the current situation, you get enough but I wanted more. I understand why this is such a 10-15yr old's hit. Being as I am well above this age bracket I can still love this book disregarding the such young ages of most characters. As far as sequels goes...well I would stop here. I tried Speaker of the Dead and was GREATLY disappointed. Ive found you ether love SotD or you dont, its an indirect continuance of the universe not the story. Ive been told I should check out the Shadow series to get more like this original book but after SotD I am hesitant. This is definitely a must read but after this is up to you. I think I will just let it rest personally and enjoy the book as it is. Harold and Lucille Hargrave's lives have been both joyful and sorrowful in the decades since their only son, Jacob, died tragically at his eighth birthday party in 1966. In their old age they've settled comfortably into life without him, their wounds healed through the grace of time.... Until one day Jacob mysteriously appears on their doorstep - flesh and blood, their sweet, precocious child, still eight years old. All over the world people's loved ones are returning from beyond. I think for me this book left a lot of open questions. I started this with the first 3 prequel books which left me in suspension. I pre-ordered this book with hopes of continuing the story(s) from those short stories and answer a lot of the questions I felt at the time must have been saved for the full title. I was left with a lot more to be desired. Dont get me wrong the book is well written and flows together just fine, its just I wanted more out of it. I felt there could have been more easily added that could have made this book not only good but shine. The author leaves you with a great message about love, memories and regret which is in itself worth it. I felt the ending was rushed however surprisingly satisfied once it was all said and done. There is far more going on here than just a bunch of resurrections. This will open your mind to thinking about how you would feel, what you would do, and what you would experience if you had one more chance. All in all The Returned is definitely worth the read/listen regardless of your belief in God. Wildcat colonies are illegal, unauthorized, and secret - so when an injured stranger shows up at the wildcat colony New Seattle, the colony leaders are understandably suspicious of who he is and what he represents. His story of how he’s come to their colony is shocking, surprising, and might have bigger consequences than anyone could have expected. 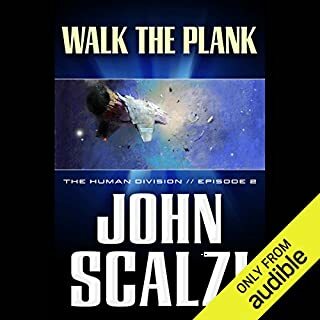 Walk the Plank is a tale from John Scalzi's The Human Division, a series of self-contained but interrelated short stories. I dont know why the same narrator would change his style. In ep1 he was alright, in this ep i couldnt even tolerate it. Reading names before each sentence, reading doors opening, horrible. What a shame, I was really looking forward to the hole series after the first episode. Now? skipping all the rest. 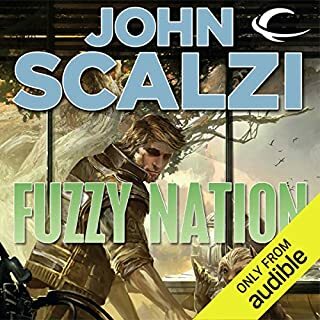 So this audiobook is actually 2 books Part 1 is the reboot story "Fuzzy Nation" and Part 2 is actually the original book "Little Fuzzy". I will only review Fuzzy Nation. Fuzzy Nation was a great story. I enjoyed it very much. I have not read any of Scalzi's books I had come across it as another narration by Wil Wheaton, which is now my favorite reader by the way. The story is suspenseful, trilling and fun. I only gave the story 4 stars because I wish there was more of the story or that it would be prolonged. It felt a tad rushed or parts left out, but please dont take this as the story is missing something because it isnt. Hopefully there is a sequel written soon. 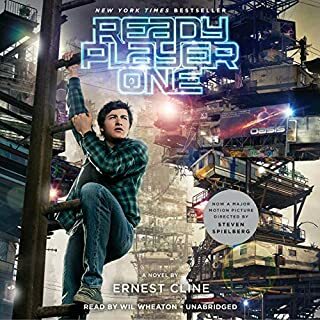 Recommendation: If you like Wil Wheaton and/or futuristic novels check out "Ready Player One" by Ernest Cline. It wont fail you, I promise. This has just jumped up to my most favorite book ever. It has it all, action, suspense, mystery and love. FILLED with 80s nostalgia and video games in the future, this was PERFECT for me. Wil Wheaton really fills the shoes of the characters very well and fits nicely into my vision of how the main character would sound. The book is well structured and will leave you wanting more and more. I could stop the book in wanting to know what happens. Excellent! There has been talk of a sequel and if so would be an INSTANT BUY. 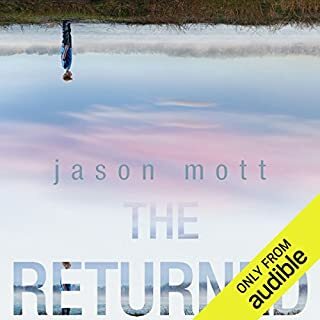 If you grew up in the 80s and/or early video games this is definitely for you, even if you dont the book, I feel, has enough to stand on its own as just the story to get you hooked. I wanted this to actually be real at times so that I may experience the awesomeness that is this world (minus the bad of course hehe). Thank you Mr. Cline for delivering on my inter-self of hope and fantasy. In "Down and Dirty", a woman fantasizes about the gorgeous stranger working at the construction site every morning as she passes. Finally her dreams become reality as she gets down and dirty with the mysterious man. the narrator isnt that good but the story is decent. It leaves a lot of questions, well not even questions, more like loose ends. Its free, its a good listen if you like these kind of stories. 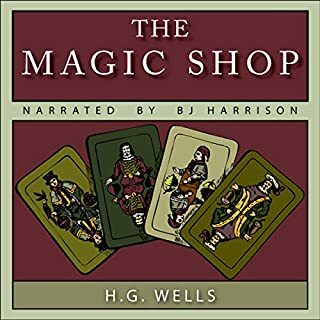 What did you love best about The Magic Shop? The story was a refreshing short story. I stumbled upon it by looking for my other 2 favorites by H.G. Wells. I went into the story not really expecting much since the story was very short compared to his other works but I was pleasantly surprised. The story drops you into the mind of a father and an experience with his son. The ending was not what I expected, but then after all I did not expect anything. This is a good story and expresses the mind of H.G. Wells a little bit more. The narrator was very good. His expression in his voice are great and he does a very good job in separating out the characters. I will definitely be subscribing to his free story podcast from his website.